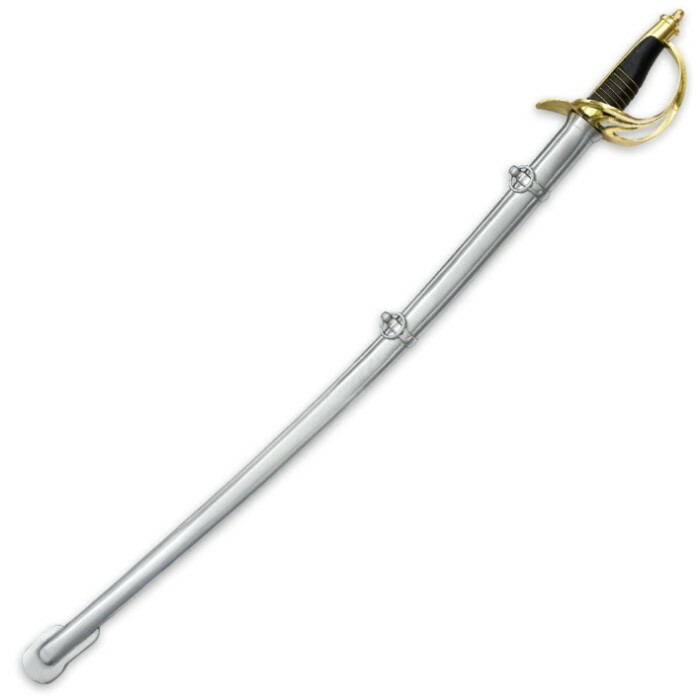 US Model 1860 Light Cavalry War Replica Sword | BUDK.com - Knives & Swords At The Lowest Prices! 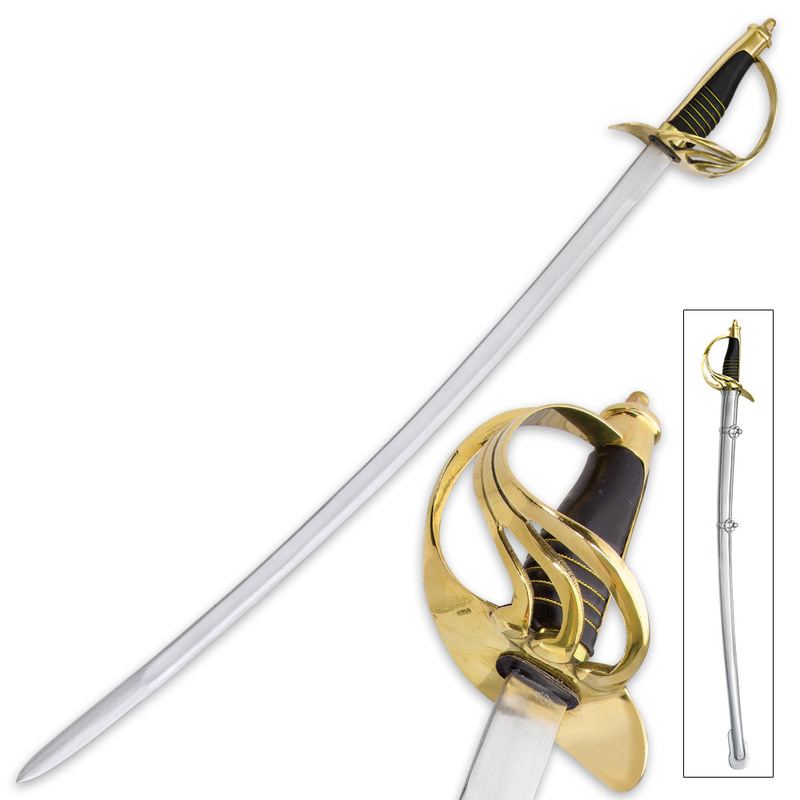 This fine replica sword is patterned after the US Model 1860 Light Cavalry Saber issued prior to the Civil War. It was also used during that period and into the Plains Indians Wars of the 1870s and 1880s. Measuring 40" overall, this saber features a 35" high carbon steel blade and a leather wrapped handle. It comes with a nickel-plated steel scabbard. This is a superb item and will make any Civil War or historical collector supremely satisfied with its authenticity and detail! Great saber I love it. Great product @ any price! I don’t see how anyone can make such a high quality product like this with such a ridiculously low price. My friends and family loved it. 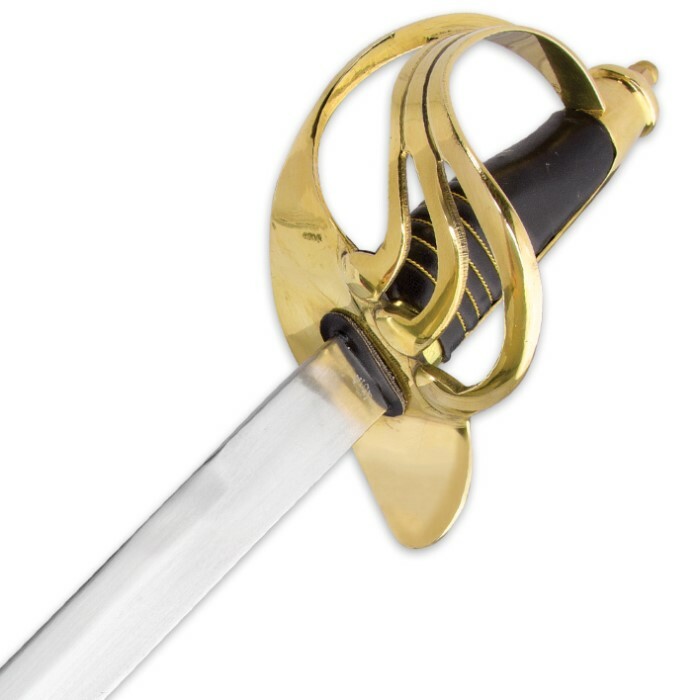 This is a Union light Calvary Sword and if they come out with a Confederate version i’ll Buy it because I would like too have the set. A fine saber at this price range. I collect Iaido katanas so I have some experience with carbon steel blades. This came very well protected in shipment. The saber and scabbard come shipped together, the saber is placed outside the scabbard. Both pieces are oil protected and come wrapped in a plastic sheath. Firstly, I unwrapped the saber. I used mineral "spirits" to clean the blade (only takes a minute to do this). Then I tightened the small tang nut at the end of the handle. I then put a light coat of mineral "oil" on the blade. Cleaned the scabbard with mineral "spirits". Then I took a small file and lightly "de-burred" the inside of the scabbard "mouth". I then sprayed WD-40 inside the scabbard. Then I placed the saber in the scabbard. Not all the way into the scabbard at first. Put the saber into the scabbard several times, until the saber worked it's way fully into the scabbard. Looks beautiful, and everything feels really solid. The saber comes dull, which is fine for me. A great buy at Bud K !!! Few Knicks and scratches on the scabbard and the blade side. Few marks on the hilt and a crudely etched India marking. Knowing people who own a high end model 1860 I can say that the blade is way more difficult than it should be to pull and return the saber from the scabbard. Can't beat 40 bucks so im not complaining. If you want something outstanding be prepared to spend over 100. Purchased this saber about a month ago for myself. Could not believe the way it looked and felt when I opened the box. Had to do a couple of minor modifications to it but well worth the time. Recommend replacing leather cushioning ring and spraying the the inside of the scabbard with WD40 or liquid wrench (turn upside down on cloth to drain excess). Some minor fileing on scabbard throat to remove rough edges and to make removing and replacing saber smoother. Showed it to my brother in law and now he's ordering one for himself. We are both retired military. Plus I'm ordering a second one for a friend who is also retired miltary. I got this thinking it was gonna be a decent blade it was dull, the scabbard as a heavier curve then the blade, and the blade was jammed into the scabbard. I was dissapointed to see it was made in india and not the US. Something I noticed a little after I got over my original hype about buying a sword was the the balance point is about eight inches from the top of the hilt. I tried swinging it to test it, and the balance point where it is made it rather uncomfortable and awkward, also making my wrist tire quickly. It doesn't have a distal taper, but if it did it would be lighter and more agile in the hand. As a wall-hanger, it's good, and the assembly is pretty sturdy. The sword is super! Beautifully made, and I've had it etched for my boss with his military dates of service, grade, and name. It's amazing. Thanks for the quick shipping too!